San Francisco 49ers coach, Jim Harbaugh, recently appeared in Judge Judy’s courtroom, not because he was suing anyone or being sued, but because he is a huge fan of the show. Harbaugh and his dad, Jack, were in the audience for the taping of an episode of the Judge Judy show that aired Monday night, June 3, on CBS and apparently they were enjoying themselves. 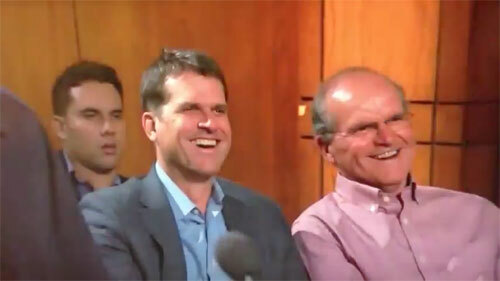 Photo shows 49ers coach Jim Harbaugh and his dad, Jack laughing at a taping of Judge Judy. It looks like Judge Judy and Jim Harbaugh are mutual fans. If you would like to book football speakers or NFL coaches like Jim Harbaugh for a speaking engagement, autograph signing, product endorsement, Super Bowl party, golf tournament, charity fundraiser or special event, you can request Jim Harbaugh agent and speaker fees at SportsSpeakers360.com. For booking agent and appearance fee information on how to hire San Francisco 49ers players for appearances or call 1.855.303.5450.